The mobile application is the buzzword in the business world. As far as the social gathering and meeting is concerned, mobile apps play a significant role as it is very user-friendly and easy to use. Nowadays, many successful paid up apps are in the market for the purpose of identifying the mutually interested people. Such apps are Tinder, MeetMe, Swoon, Grindr, Skout, Zoosk, POF and many more. The outstanding iPhone app developers from Agriya dedicated themselves to avail a first-class iPhone app script to run the full-fledged dating application immediately. This readily available script- Burblr is popularly known for its uniqueness. Today, we shall explore how easy to get this app script for developing your dating application rapidly. Tinder clone from Agriya comes with everything out of the box for developing your own groundbreaking dating application on the iPhone within a few touches. It is a specially made iPhone app which customizes the dating application based on your requirements. To speak about the essential features of this app is in plenty. We have taken a special care of the app features since most of the it is utilized by the app users. Each and every feature imparted in this app helps the users to impeccably find out their suitable match with ease. On the whole, this app provides a complete assistance to the entrepreneurs to run their dating app business even more effectively and efficiently. In order to establish your dating application with the help of our app script, you have to just do the following steps. 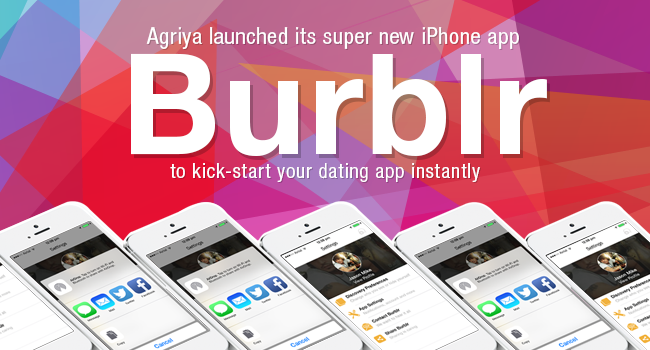 Our Burblr Dating app can be easily downloaded from the Apple Inc. Go to the Apple store, search Burblr app and download it straight away. Or else to start downloading the app from the Apple iTunes directly. We made the installation process of your dating application on your iPhone so simple and easy. We assist you to set up your own portal in the iOS quickly and avail you a step-by-step procedure for submitting your application to the Apple store.